Bathroom experiences can easily alter one's view on a restaurant, business or school. According to Bradley's 2013 Healthy Handwashing Survey, 64% of Americans say they’ll think twice about patronizing a business or will never visit again if the restrooms are less than satisfactory. Since restroom cleanliness is proven to be a large factor in the perception of a business, how do businesses detect and overcome uncleanly restrooms? Point-of-Sale survey kiosks may be the answer. 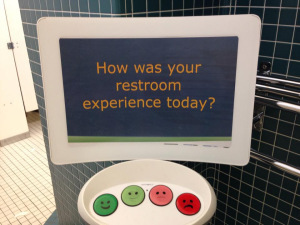 Kiosks, much like the one pictured above, can quickly record and measure patrons' reactions to their experiences. Usually seen when making a purchase at a store or online, some businesses are beginning to incorporate them into their restrooms. However, there are some positives and negatives to this idea. Positive: real time response to bathroom cleanliness so cleaning crews can act accordingly and keep the restroom presentable. Negative: Reliability of the survey. Will patrons be willing to touch the buttons of the kiosk if the threat of non-handwashers using the kiosk prior to them lingers? These are just a few pros and cons to this new use for POS surveys. Tell us what you think. Could your business or the businesses you patron benefit from such technology?